Sentinel Dome is a granite dome located in the Glacier Point area of Yosemite National Park. It is one of the more popular hikes in the area, and for good reason. The summit provides a commanding position to take in panoramic views of the Yosemite Valley and surrounding area. It is a great vantage point to see El Capitan, Yosemite Falls, Half Dome, Nevada Falls, and so on. The hike is just over two miles round trip and 400 feet of elevation gain. Our family made the hike up Sentinel Dome during a long National Park road trip and really enjoyed it. The crux of the day may have been finding a place to park in the somewhat small trailhead parking lot. The trail starts off angling across a hillside heading north east before Sentinel Dome comes into view. Next you circle around to the northeast side of the mountain, then its a nice little adventure hiking up the granite slabs to the summit. We hung out on the summit for a while, snapping photos and soaking in the tremendous views of the famous surrounding landscape. Truly an awe inspiring place, and well worth the visit. 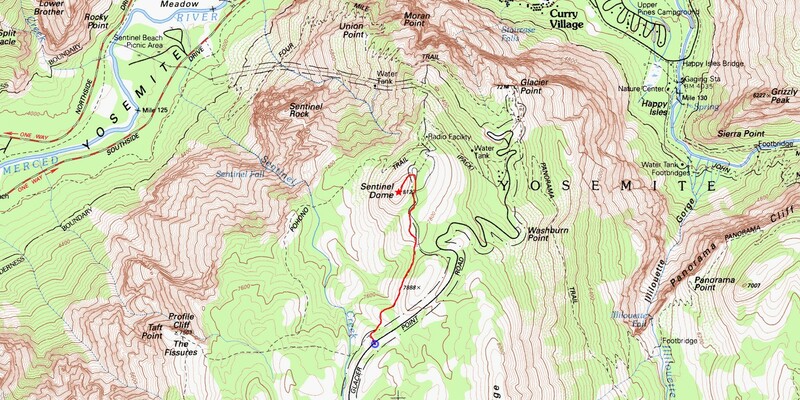 Map of the route, just over two miles round trip, 400' elevation gain. On the trail, Sentinel Dome in the distance. Final stretch to the summit of Sentinel Dome. View of Yosemite Falls from the summit. Summit marker that labels the panoramic view seen around you. Posing on the Jeffery Pine, famously photographed by Ansel Adams in 1940. Yosemite Valley and El Capitan from the summit. Half Dome and Nevada Falls from the summit.